Nordic U-6 Co-ed Fall Program. This program is designed to foster a love for playing the game through the implementation of learning enhancement activities that highlight a specific skill or tactic “of the day” whilst engaging the enthusiast in activity. Players and families registering and participating in this program will be enthusiastic soccer beginners who are committed to starting their soccer education and play with sound fundamental development. Our U-6 program will consist of weekly training sessions in accordance with our center-wide curriculum. All activity will be directed by the Nordic S.C. Youth Director and other qualified and experienced Nordic S.C. coaching staff. This program is for players born between 1/1/2011 and 12/31/2012. Excellence in player development requires excellent instruction. The Nordic U6 program is fully staffed by qualified coaches. Our comprehensive center-wide curriculum is modeled after European Professional Youth Development Academies. Young players learn efficiently and effectively within an inviting structured learning environment, with positive motivation, and the correct attitude toward learning and practice. We acknowledge the fact that young soccer players today are getting loads of playing time, but are receiving very little quality instruction, if any at all. Simply playing soccer will create and reinforce habits, good or bad. Most often-in match play, young players are simply practicing bad habits, which deter the learners from becoming quality players, thus, nullifying any chance of having a quality experience or longevity within the game. When & Where: Tree Farm Soccer Complex in Essex Jct., Mondays 5pm to 6pm. Fall Session: Mondays - 9/12, 9/19, 9/26, 10/3, 10/10 and 10/17. Register: click on Program registration in the upper left hand corner on our soccer club homepage. This program is designed to prepare the U-8 player for future participation in the “World’s” game of soccer. Players participating in this program will be highly motivated soccer enthusiasts who are committed to personal soccer development and achievement. Our U8 Fall program will consist of one weekly 60-minute training session, in accordance with our center-wide curriculum as well as participation in the VSA fall league with games on Sunday. Our goal is to have an 8 to 1 player to coach ratio to maximize learning potential for players. We do not travel outside the immediate area for matches or events with this program. Nordic’s primary goal is to foster a "love" of the game, whilst enhancing proper playing habits through implementation of our center-wide progressive curriculum. Nordic Soccer Club is always sensitive to the individual player's needs, potential and development of personal excellence. The curriculum is based on sound principles of learning. Attention to detail and the need to insist on the highest standards and acquisition of good learning and practice habits are essential elements in our learning environment. Player registration should be based upon commitment to learning, work ethic, character and a love for the game. This program is for players born between 1/1/2009 and 12/31/2010. Excellence in player development requires excellent instruction. Nordic’s U8 program is staffed by qualified coaches. Our comprehensive center-wide curriculum is modeled after European Professional Youth Development Academies. Young players learn efficiently and effectively within an inviting structured learning environment, with positive motivation, and the correct attitude toward learning and practice. When & Where: The Tree Farm Soccer Complex in Essex Jct., Practices on Wednesdays from 5pm to 6pm and games on Sunday afternoons. 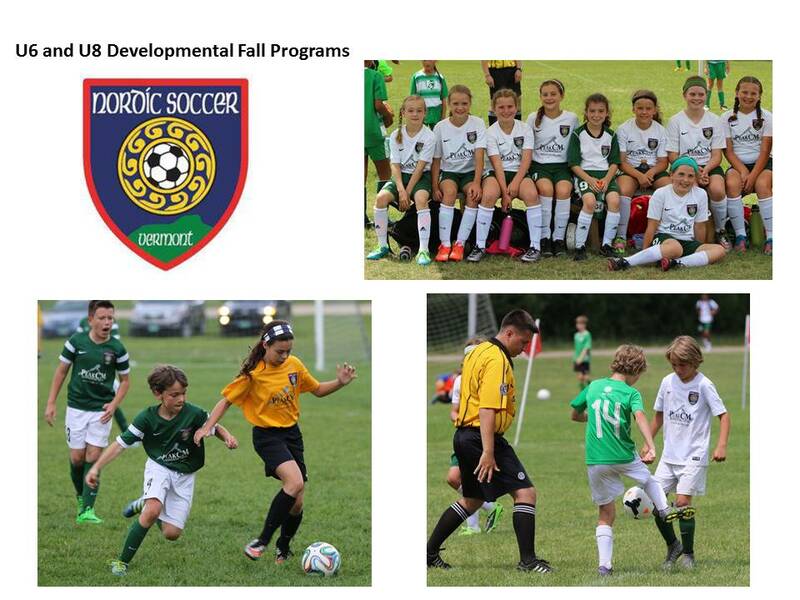 Fall Session: Wednesdays – 8/31, 9/7, 9/14, 9/21, 9/28, 10/5, 10/12 and 10/19. Sundays – 9/11, 9/18, 10/2, 10/9, 10/16 and 10/23.